This is the stall that never failed to open and inevitably making a long queue line in UPH bazaar! Their place is always the same, too, in the far corner in front of the “lake”, or the weird structure when it’s dry. The stall from the outside. And it’s not the most crowded moment! This stall is always crowded more likely to the sentimental and memory value of childhood snack. And because it’s actually geared towards children, it’s cheap(er than any other stall)! At Rp. 10,000 for 5, it’s actually quite expensive compared to the usual price outside. There are nothing different or special too about this particular one. But it’s still good, of course. One thing to improve the taste? We advice to skip the sauce! Cimol – got no good pics! Will update later! This is priced quite normal compared to the other items in this stall. Rp 5,000 for 3, it is not exactly a bargain, but not a bad deal. It is crispy and sweet, but ordinary – I have eaten better Piscok somewhere for sure. Interested to visit this stall? Please do! You can take a nostalgia trip and it is (quite) low-cost snack. Remember to avoid coming at lunch time though, as the waiting time will be long and lunch break will be over before you know it. Overall rating :4/5 – can’t deny we love it too! Piscok, an abbreviations of pisang-coklat, roughly translate into “Chocolate Banana”. 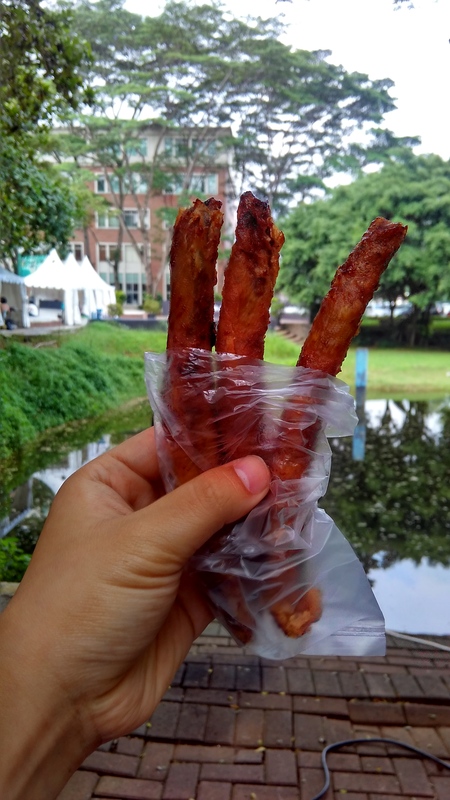 But Piscok is deep fried banana and melted chocolate wrapped in lumpia skin like dough, different from the choco banana usually found in Japan or America where a banana is freeze-dried and then dipped into chocolate. I imagine this will be good eaten with cheese or ice cream. I am pretty sure it is originally a Dutch snack, or maybe an Indonesian snack that are formed during the era Netherland invaded this country, judging from the name, Lekker.